Description: This is a very rare (unique?) monstrous Astrophytum asterias cv. Superkabuto showing peculiar characteristics. The stem is spherical flattened, almost disk shaped and densely covered by a creamy-white felt. 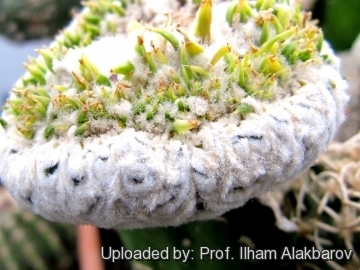 Surprisingly a ring of slender, triangular ariocarpus-like tubercles sprout around the woolly crown. Cultivation and Propagation: This is a very rare plant that grows quite slowly. 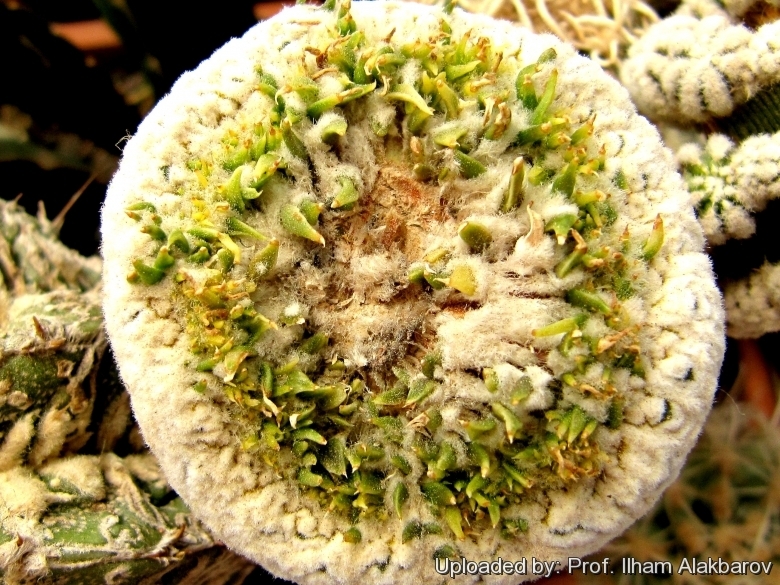 It is only seen as a grafted plant. Watering: Water sparingly from March till October (weekly during summertime, if the weather is sunny enough), with a little fertilizer added. keep perfectly dry in winter. Hardiness: Overwinter at temperatures from 5 to 15 degrees centigrade. In the rest period no high atmospheric humidity!! Exposure: It needs a good amount of light shade to full sun this help to keep the plants healthy, although slow growth. Propagation: Grafting. Plants are usually grafted onto column-shaped cacti.